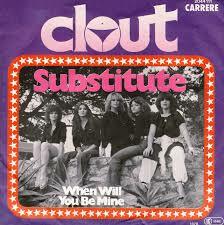 Clout’s ‘Substitute’ became the 30th song by a local act to top our charts as it took over the number 1 spot from Heart’s ‘Barracuda’. The latter had spent a broken run of 7 weeks at 1. It was interesting to note that the 10th local chart topper, Cornelia’s ‘Picking Up Pebbles’ and the 20th, Lauren Copley’s ‘Kentucky Blues’ were by women and the 30th was by an all woman group. Bonnie Tyler on 30 weeks in the charts became the 3rd act to have at least 30 weeks under their belt before seeing their first biggest climber award. ‘It’s A Heartache’ climbed 8 from 12 to 4 to take the award. Dennis East on 31 weeks and Engelbert Humperdinck on 42 weeks were the other 2 acts to be on 30 or more weeks when getting their first biggest climber award. Three songs just missed out on sharing the biggest climber award with Bonnie Tyler and those were Wings’ ‘Mull Of Kintyre’, Uriah Heep’s ‘Free Me’ and The Bee Gees’ ‘How Deep Is Your Love’ which all climbed 7, landing at 2, 8 and 13 respectively. These were the only other star raters this week. It was the Bee Gees’ 19th star rater and they were the second after Tom Jones to reach this many. Jones was still a few ahead of them on 23. The faller of the week was McCully Workshop’s ‘Buccaneer’ which dropped 6 from 5 to 11. Joe Dolan’s ‘I Need You’ was enjoying its 15th week on the chart and its 3rd as the oldest in the top 20. Rabbitt’s SA chart career came to an end as ‘Getting’ Thru To You’ dropped out of the top 20 after a run of 5 weeks and a peak of 15. Of their 4 hits, this was the tied lowest peak, sharing that honour with ‘Morning Light’, but it beat the latter for weeks by 2. Overall Rabbitt spent a total of 29 weeks in the charts with ‘Charlie’ seeing their best peak of 9. Rabbitt fans could take some consolation from the fact that ex-band member Trevor Rabin was still in the top 20, sitting at 16 with ‘Fantasy’, however, that song was falling. Also going was Leo Sayer’s ‘Thunder In My Heart’ which lasted 8 weeks and peaked at 6. Sayer had managed 7 hits so far and only 2 had managed to get into double figures for weeks. This was his 3rd highest peak so far. Our first new entry was Debby Boone’s ‘You Light Up My Life’. The song was written by Joe Brooks for the 1977 movie of the same name which he directed and produced. The original version was sung by a Ukrainian singer, Kasey Cisyk but in the film it was Didi Conn (who also played Frenchie in the film ‘Grease’) who is shown ‘performing’ the song. Cisyk’s version made number 80 in the US. A year later, Debby Boone (daughter of Pat), took her version to the top of the US and Canadian charts. She also made number 7 in Australia and 48 in the UK. The song would be the 5th that won the ‘Best Original Song’ Oscar to chart in SA. It also went on to share the Grammy song of the year with Barbra Streisand’s ‘Evergreen’ (which wouldn’t chart in SA). In 1997 Leann Rimes took a cover to 34 in the US. The second new entry was by one time husband to Liza Minnelli, Peter Allen who was born in Australia on 10 February 1944. ‘I Go To Rio’ was the 18th song to chart by an Aussie and would top the charts in his native country. Aside from that it made 15 in Rhodesia, 18 in Holland, 22 in New Zealand and 30 in Belgium. Allen would not chart in the UK and would only have 1 US hit with ‘Fly Away’ which made number 55 on the Billboard Hot 100 in 1981. He had appeared on our charts before as a song writer, being the person behind Olivia Newton-John’s ‘I Honestly Love You’ making him the 24th person to chart as a song writer before charting as an act. 7 of those 24 had written songs for bands that they were in. Allen died in 1992 at the age of 48, becoming one of the first well known Australians to die from HIV/AIDS. Hugh Jackman (well known for his role as Wolverine in the ‘X-Men’ films) played the role of Allen in the stage version of the musical ‘The Boy From Oz’ which was about Allen’s life. Jackman won an Emmy for his performance. Rod Stewart hit the 20 week mark while, as mentioned above, Bonnie Tyler clocked up her 30th. Abba meanwhile pulled 1 week ahead of Elvis to take 3rd place overall. They were on 132 weeks while Elvis on 131 slipped into 4th place, only 4 ahead of The Bee Gees in 5th and the Bee Gees had just had a new entry so were busy closing the gap. We had 4 places named in the title of the songs in this week’s top 20. At 2 was the Mull of Kintyre, New York and L.A. got a mention at 10 while Rio was namechecked at 19.